Adriano Bio can start on his birth date in Rio de Janeiro, Brazil on February 17th 1982. Born in Rio de Janeiro, it was no surprise that Adriano would want to become a professional soccer/football player when he grows up. Adriano bio shows that his passion for soccer/football grew even more after following Brazilian soccer/football magicians such as Zico, Falcao, Dunga, Romario and Bebeto just to name a few. Biography about Adriano as a professional soccer player starts at his first club Flamengo where he immediately gained respect on the field with his deadly powerful left foot and his strength on the ball. Footballer Adriano signed his first professional contract with Flamengo in 1999. Adriano biography stats show that he did not start his career in a great way for Flamengo as he started 19 matches and scored average 7 goals during the 2000 season. Adrianos style of play had started to attract European scouts which opened the doors for Adriano to be great in the future. 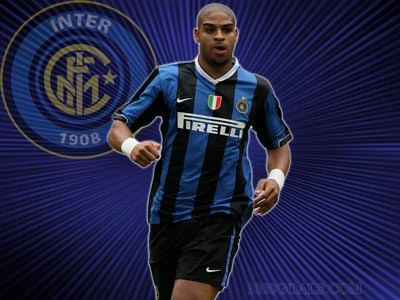 Being only 19 years old Adriano biography continues with the move to Italian Powerhouse Inter Milan where he scored an impressive free-kick in his first friendly match against Real Madrid . Adriano biography stats at Internazionale show that his first season he only scored one goal in eight games that he played during 2001 season. Inter still saw potential in Adriano so they loaned him to Fiorentina where he managed to improve and settle into Italian style of soccer/football by scoring 6 goals in 15 matches as his biografia stats show. After bringing the Romanian attacker Adrian Mutu from Inter Milan, Parma wanted another Inter Milan striker to help improve their offense setting their sights on footballer Adriano. Inter refused to sell Adriano, however a deal was negotiated and the player would be co signed by both Parma and Inter Milan. Biography on Adriano continues with a miraculous partnership alongside Adrian Mutu and the duo scored 40 goals together during the 2002-2003 season which made a big impact on footballer Adriano biography. Inter immediately made plans and brought Adriano back one year later tying him to Inter Milan until 2008 for a sum of 58 Million Euros. Inter had to pay only half because Adriano's contract belonged to both Parma and Inter Milan but Parma would walk away with a profit of 16.5 million euros on the Brazilian. Footballer Adriano biography shows that he was considered a savior by arriving to Internazionale as he helped them reach Champions League with his 9 goals during the 13 matches in his first season back. Adriano kept netting goals and performing on a peak level that Inter Milan owner decided to reward him with an improved contract extension until June 2010. Following the new contract Adriano's form suffered because of the death of his father and poor work ethic. He would gain weight, stay out partying and miss practice. This would also cause him to lose his spot on the Brazilian National team with Coach Dunga publicly saying that Adriano needs to "change his behavior" and "focus on football". In 2007 Adriano career took another shot when the Inter Milan owner decided to send Adriano on second unpaid time off in 18 months to train with Sao Paolo. Inter tried to help Adriano get his form back by loaning him to Sao Paolo for 2007-08 season as his footballing biography shows but this did not work out well as he would walk away from practice, get red cards during games and just continue to dig his own hole deeper and deeper. From here Adriano went back to Inter Milan during the 2008 season but Inter had enough of him and released him from his contract. This led Adriano to sign with Brazilian side Flamengo where it all started. After having an OK season with Flamengo, he signed a three year contract with Roma for 5 million euros annually. Only 7 months later Roma let Adriano go. He signed another one year contract with Corinthians on March 25, 2011. As you can see footballer Adriano biography has many ups and downs and once great footballer Adriano just faded away as a top soccer player in the world.